CINCINNATI (Sept. 27, 2018) – Smart, quick-to-the-point packaging can make all the difference when today’s busy consumers are scanning the beverage aisle for their next drink purchase. 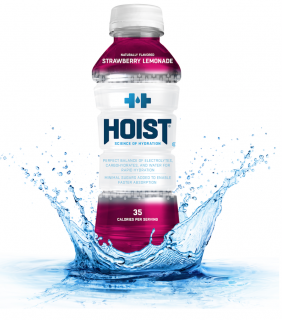 After reviewing consumer feedback, Hoist, a hydration beverage company based in Cincinnati, will be launching a sleek new look for 2019 sets. Hoist will be revealing its new look for each of its four flavors at industry trade show NACS, which begins Oct. 7. Hoist will be at booth #1875. Trade show attendees are encouraged to stop by for Hoist samples. In addition to the new packaging, Hoist continues its mission to use natural ingredients. The beverage, which already doesn’t have any added colors, high fructose corn syrup, dyes or artificial sweeteners, will now include pure cane sugar instead of crystalline fructose. Another recent change includes removing preservatives from its product, which means Hoist will now come in hot-filled bottles. Boasting its new look and revised recipe, Hoist will hit the shelves of 4,500+ CVS stores nationwide beginning Dec. 30 as part of the retailer’s New Year’s program. Hoist’s one-of-a-kind formula is perfectly isotonic, meaning it’s absorbed directly into the human bloodstream to hydrate the body immediately. It’s the perfect solution for consumers looking to stay healthy and hydrated no matter what stage of life they’re in. You can find Hoist near you using Hoist’s store locator. Flavors include Dragonfruit, Watermelon, Strawberry Lemonade and Orange. For more information, visit www.drinkhoist.com. Founded in 2009, Hoist was developed to fill a void in the hydration marketplace. Hoist’s formula is perfectly isotonic, meaning the formula’s density matches that of the human bloodstream and thus has the ability to be absorbed directly into the bloodstream, hydrating the body immediately. Without any added colors, high fructose corn syrup, dyes, artificial sweeteners or preservatives, Hoist offers consumers a way to hydrate faster while consuming less calories and less volume. Hoist is currently available at 10,000 store locations across the country. For more information, visit www.drinkhoist.com. You can also find Hoist on Facebook, Twitter, Instagram and YouTube.